New programs to teach and restore the lost language and cultural heritage of the Lakota Sioux offers hope for the children who live on reservations where dire poverty, suicide, unemployment and substance abuse have become a way of life. For more than a century the Lakota language endured a deliberate and systematic attempt to eradicate it. As a tool of colonization, the killing of language was a means of severing indigenous people’s ties to their culture, history and spirituality. The system, which began with President Ulysses Grant’s 1869 “peace policy,” continued well into the 20th century. Church officials, missionaries and local authorities took children as young as age 5 from their parents and shipped them off to Christian boarding schools. They were separated from their families most of the year, sometimes without a single family visit. Parents caught trying to hide their children lost food rations. The horror of the boarding school system actually went much further. In Canada, as Amnesty International explains, “a 2001 report by the Truth Commission into Genocide in Canada documents the responsibility of the Roman Catholic Church, the United Church of Canada, the Anglican Church of Canada and the federal government in the deaths of more than 50,000 native children in the Canadian residential school system. The report explains how “church officials killed children by beating, poisoning, electric shock, starvation, prolonged exposure to sub-zero cold while naked, as well as medical experimentation, including the removal of organs and radiation exposure. These methods of dehumanization are contributing factors to the intergenerational or historical trauma still affecting the Lakota Nation today. There are no children on the Standing Rock Indian Reservation in North Dakota who are fluent speakers of the Lakota language. Thipiziwin Young is one of a group of Lakota who are now determined to change that. Young, a Lakota second-language learner and Lakota language activities instructor, is working with a team in Standing Rock’s very first Lakota language-immersion classroom. The class consists of 12 preschool-age students, two language activities instructors and a first-language-fluent speaker. The class is held at Sitting Bull College. The program is made possible under a grant from the Department of Health and Human Services Administration for Native Americans. Students are as young as 3 years old. Everything, including all learning materials, is presented in the Lakota language. No English is permitted to be spoken in the room. The goal is to develop first-language acquisition skills that allow children to become natural thinkers, singers and speakers of Lakota in a fluid and imaginative way. Young, a mother of three, is a graduate of the Lakota Language Education Action Program, or LLEAP. The program is a collaboration between Sitting Bull College tribal leaders, the Standing Rock Sioux Tribe’s education department and the Lakota Language Consortium. Young is from Fort Yates, North Dakota, a community that has seen their language diminished more than most. “How people look at us is how we often end up defining ourselves”, says Young. “We live in a place where all these negative statistics are sky-high and that’s our everyday reality”, she says, speaking of the high rates of suicide, poverty and unemployment throughout her reservation. Weston explained to Truthout that “most of our first-language speakers are probably in their mid- to late-50s now and we don’t have a very high life expectancy.” Standing Rock life expectancy is believed to be about 47 years for men, 58 for women. Realizing that her mother, Marjorie Edwards, a fluent first-language Lakota speaker and teacher who passed away recently at age 59, was part of the last generation of first-language speakers, Weston has committed herself to the revitalization of indigenous languages. She writes and co-produces OurMotherTongues.org, which is an informative web site, dedicated to Native American language revitalization. It is the companion site to “We Still Live Here,” a film about the return of the Wampanoag language. Weston served as assistant producer. “By the time we are in our 30s, we are going to be looking at a five- to ten-year window where we may not have any first-language speakers there to teach us,” says Weston. For the Lakota, reviving their language goes far beyond communication. 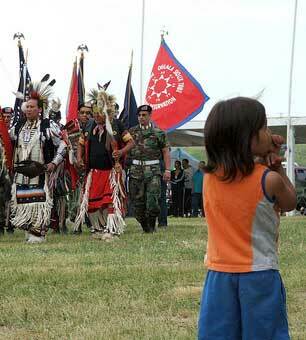 To the Lakota, language is culture. The compartmentalization of all aspects of life is a foreign concept forced on them by western systems of thought, much the way that English was. The Lakota language “gives children a sense of how our ancestors related to everything. We have the phrase, ‘mitakuye oyasin,’ that we all learn as a way of closing a prayer, or expressing ‘we are all related,'” Weston explained to Truthout. This article first appeared on truthout.org on October 8, 2015. © Truthout. Reprinted by permission.